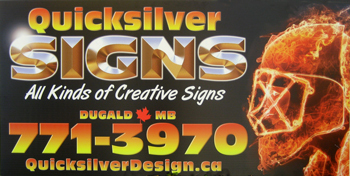 QuickSilver Signs & Graphics In business since 1999 Specializing in signs of all kinds, vehicle graphics, print ready artwork, logo design, web design & window film. We design, produce, and install a wide variety of signs for Winnipeg and surrounding area. Proudly located in Springfield, Manitoba's first municipality. Give us a call or email and we'll be happy to come see you to meet all your graphics needs. Clients who understand the value of their brand appreciate that high quality signage and print media is not an expense; it is an investment. Whether your signage is for the purpose of identification, direction, promotion or just for decorative purposes, Quicksilver Signs & Graphics can create a lasting impression and enhance your image on your building, office, vehicles or any special event promotion. We make all type of signs, banners, lettering, vehicle wraps, office signs & more! Need a new company image or promotional item? We design that as well - logos, brochures, ad & print design, magazine layout as well as website and internet graphics. Email quicksilver@mts.net for a fast, free quote.